Papierfabriek Doetinchem bv produces MG paper from 100% recycled material. Paper Projects is part of Papierfabriek Doetinchem and processes paper into sheets, deskrolls and counterrolls which are ready for use. Papierfabriek Doetinchem bv is located in the east of the Netherlands, near the German border. The mill produces 70.000 metric tonnes of 100% recycled lightweight (MG) papers per annum for a wide range of applications. The operation runs 24/7 with more than 150 employees. The vast majority of the production is exported and, although Europe is the main market, customers can be found in America, Africa, Asia and Australia. Paper Projects is part of Papierfabriek Doetinchem bv. Its primary task is to convert part jumbo reels in sheets, deskrolls and counterrolls which are ready for use. The company focuses mainly on the automotive aftermarket, packaging wholesalers and internet retailers. Paper Projects runs a 2 shift production (16/5) with over 25 employees. A market-driven organisation, short communication lines and a customer-focused approach are our main principles. We are strongly focussed on creating a reduction of weight and total costs without a loss of performance. Because of our extensive portfolio of paper grades and the large range of applications in which our papers are successfully used, we have a vast amount of knowledge to share with you. Simultaneously, we will always remain eager to learn more. We believe long term partnerships and a close co-operation is the only way to decrease costs and increase mutual success. We wholeheartedly support the development of safe and sustainable materials. Of course, all products are made from first class recycled fibres and can be recycled again. All products in our portfolio are biodegradable and standard PEFC™ certified (FSC® by request). All relevant products also have safety certificates for food contact. Paper for a wide variety of purposes, entirely made out of recycling. Fully recyclable, but also 100% biodegradable. Certified as FSC®, PEFC™ and safe food contact. "Sustainability" is getting more and more important in consumers’ decision making. Europe’s leading retailers have therefore already decided for the products of Papierfabriek Doetinchem / Paper Projects. Papierfabriek Doetinchem offers a wide range of white, brown and coloured papers for multiple applications. 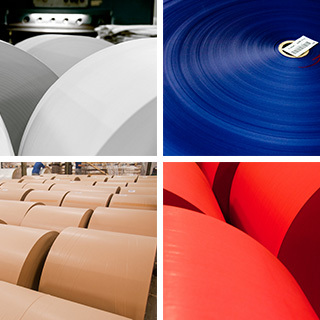 White papers in various qualities, from 24 gr/m² to 60 gr/m². Brown papers range from 28 gr/m² to 90 gr/m². Semi-crêpe range from 17 gr/m² to 23 gr/m². Our coloured papers (35 gr/m² to 80 gr/m²) can mainly be found in catering products like table covers and fruit and vegetable wrapping. Paper Projects converts the paper in sheets, deskrolls and counterrolls. Paper Projects is the manufacturer of CycleFill®, a void fill system that is brilliant in its simplicity. For the automotive aftermarket we offer a special range of specific masking papers - available in various lengths, widths and weights. This paper is also applicable in spraying cabins and is completed with a special assortment for the construction market. In order to well serve packaging wholesalers and industrial users, we have developed a wide range of packaging papers. It all starts with a fully natural and renewable source (a tree, as wood is the primary source for paper), which converts CO2 into oxygen. A headstart beyond compare! It is the start of a cycle in which paper can be recycled up to 7 times. In the Netherlands, over 80% of all paper is collected for recycling and also around 80% of all paper and board produced are made out of recycled fibres. There is no other material for which recycling is used in such a big scale! We do business in a responsible way and focus on keeping our products, processes and labour conditions simply, safe and sustainable. The areas quality, human health & safety, environmental care, energy consumption and food -/product safety are therefore fully integrated in our conduct of business. Our mill has been ISO 14001 certified already since 1999. All our paper grades have been developed to combine safety, performance and sustainability without compromise. Our total portfolio of paper grades is biodegradable according to EN 13432 and standard PEFC™ certified (FSC® by request). All relevant products also have safety certificates for food contact. In close co-operation with our customers, we continuously minimize the weight of the paper without sacrificing performance, to save both material and costs. To ensure that every reel of paper meets our high standards, our modern and well equipped laboratory starts quality checks with the reception of waste paper and carries these out through all different steps in the production process. Of course, a thorough last check on the final product is done before sending the reels to our customers. As waste paper from households (consumer waste) is too diverse for us to ensure a high quality end product with tight tolerances, we use about 15 different grades in industrial waste. Most of these grades are purchased within Europe, but some also come from overseas. Every paper grade has its own "recipe", a blend of various waste paper grades. After passing a last quality check, this blend is dissolved in water in the pulper. Waste paper can contain various kinds of contamination, like sand and plastic particles. The dissolved fibres ("pulp") are washed and cleaned in various steps. A special de-inking installation removes the ink from printed waste paper. The cleaned pulp is refined to create a stronger web. Other characteristics of the paper like colour or wet-strength can be altered by using additives. The pulp, now diluted to only 0.5% of fibres and 99.5% of water, is sprayed on to a wire to format a web of paper. In this step, the pulp is de-watered to a 50% - 50% suspension. Further water is removed in the press section. The final stage is the heated glazing cylinder, which heats the backside of the paper with hot air and created the typical smooth side on MG paper. The big jumbo reels of paper are slit into reels of the width, diameter and core as specified by the customer.